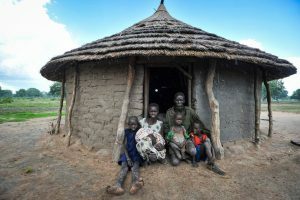 Changai, 29, and her family of six live in Rumkur, South Sudan. Photo taken June 6, 2017, by Gethin Chamberlain. As a VOA foreign correspondent reporting from Sudan back in 1969, I recall distinctly a tiny mud hut within a mile or so from the confluence of the Blue and White Niles. Its rough mud bricks were splashed with crude white lettering, a makeshift campaign poster back in the relatively brief period when Sudan had free and fair elections. Recent events have raised cautious hopes among public diplomacy specialists in the West that such an era will be re-born in two African countries where dictators have been forced from power after persistent street demonstrations challenging their rule. The same divisions are at play afflicting a third African country amidst a civil war. Unrest in one of the most promising continents, experts agree, is impeding progress. 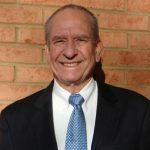 However, many more young adults and women are participating in popular uprisings appealing for change, a quantum increase since I reported from Africa and the Middle East half a century ago. 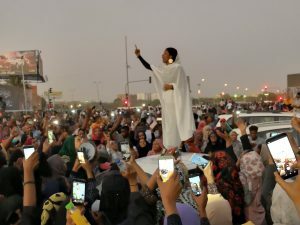 A young woman leads protesters in a chant calling for revolution in Khartoum, Sudan on April 8. The photo by Lana H. Haroun has been shared widely on social media. In Khartoum, some protesters celebrated the handovers. But others vowed to continue their demonstrations until an inclusive and representative civilian government is in place. (Defense Minister Auf announced April 12 that Omar al-Bashir would not be handed over to the International Criminal Court in the Hague. At the World Court, the deposed president is charged with committing war crimes in Sudan, including genocide in Dafur several years ago. Any trial, the army said, would be in Sudan). Street protests continue. 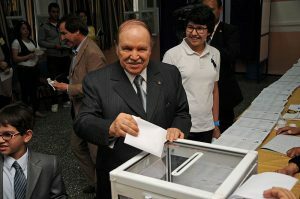 Algerian President Abdelaziz Bouteflika casts his ballot in May 10, 2012, legislative election. Photo by Magharebia. On April 2, the 20-year rule of dictator Abdelaziz Bouteflika also came to a sudden end. As in Khartoum, military commanders ousted him. That followed months of street protests when the gravely handicapped, 82-year-old president prepared to seek re-election to a fifth term. Bouteflika, who earlier ended his re-election bid, was ousted by the Algerian military as anti-regime civilian demonstrations continued. In contrast to Sudan, the military leaders in Algiers promised fairly quick elections on a significant date, July 4 this year. The army chief of staff also said that corrupt leaders of the Algerian oil and natural gas industry would be prosecuted. He added: “The army will meet peoples’ demands… the judiciary has recovered its prerogative and can operate freely.” That was to no avail. Demonstrations continue, because there’s no indication that the army leaders will relinquish control, and that a new civilian cabinet will at last be permitted to run the country. 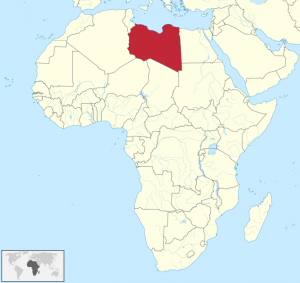 Libya is located in northern Africa. Algeria’s neighbor on the Mediterranean coast of North Africa is reported by Time magazine and other Western international media as being on the brink of a civil war. Hardline General Khalifa Haftar, stationed in eastern Libya after returning from self-imposed exile in the United States several years ago, is aiming to take control of the entire country. In a lightning campaign begun in early April, General Haftar’s troops have conquered substantial areas in eastern, southern and now even in western Libya, threatening the capital city, Tripoli. (During his exile after the killing of former Libyan ruler Moammar Qaddafi in 2011, Haftar became a U.S. citizen). According to Time, some analysts regard Haftar’s quick advances as aimed at heading off a U.N.-planned national Libyan unity conference scheduled to begin this week in Tripoli. The conference is supported by the U.N.-backed Libyan Prime Minister Fayez al-Serraj. Its principal aim: to discuss Libyan national re-unification and a timetable for long-delayed elections. 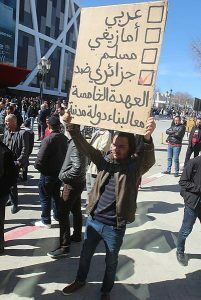 Protests in Algeria March 1, 2019. Photo by DiiDoo Kech. A solution is urgent. The U.N. says that so far, at least 47 people have been killed in Libya’s civil war, and 181 people have been wounded in the battle for Tripoli. VOA’s reporter Edward Yeranian in Cairo adds that the U.N. has issued an “urgent appeal” for a two-hour truce in Tripoli’s suburbs to evacuate civilians and those wounded, as forces loyal to General Haftar continue a push aimed at taking the capital. “Western governments,” adds David D. Kirkpatrick of the New York Times, “have almost universally condemned General Haftar’s advance on the capital, which upended United Nations efforts to negotiate a solution to the Libyan fighting.” The United States, for example, strongly backs the U.N. plan for reunification of the various factions in the divided country.